Last month Cuban baseball stars and brothers Lourdes and Yulieski Gourriel left the national team in the Dominican Republic in order to pursue careers in Major League Baseball. It was reported widely from the official Communist Party newspaper Granma to regional and national news outlets. The coverage certainly represents a change from some years ago, when the issue would have been considered taboo, but was unremarkable considering the progression of Cuban society and media since then. But for New York Times editorial writer Ernesto Londoño the incident represented a dramatic emergence of free expression in Cuba, which, he argues, has been brought about only by the Obama administration’s change in policy toward the island. While the Cuban government allows its players to compete in foreign sports leagues, the U.S. government does not permit Cubans to obtain visas due to the embargo. Consequently, Cubans seeking to play in MLB must establish residency in a third country and declare they do not intend to return to Cuba. The decision to play in MLB is literally a decision to abandon one’s country. Granma‘s story noted that the Gourriel brothers abandoned their hotel « in frank attitude of handing themselves over to the merchants of hired, professional baseball. » Londoño, however, makes the official line sound significantly more hostile in his translation, saying the brothers were criticized for « surrendering to mercenaries » of for-profit professional baseball. Since the late 1950s, the U.S. government has sponsored client states throughout the hemisphere ruled by military dictatorships who eliminated political opposition, clergy, students and peasants with death squads whose bloody campaigns reached genocidal levels in countries like Guatemala and El Salvador. In Londoño’s native Colombia, the government and its affiliated paramilitaries kill hundreds of labor and human rights activists annually and dispossess tens of thousands more. In the last two weeks alone, Telesur reports four activists have been killed. With nearly six million internally displaced persons, Colombia is second in the world behind only Syria. In Cuba, on the other hand, political disappearances and killings are unheard of since the Revolution assumed power in 1959. Nor is there even one single refugee from violence. American critics of the Obama administration’s rapprochement with Cuba have called the shift in policy a failure by focusing on how rigid the socialist government has remained. They’re missing something important: The new relationship has done much to diminish the culture of fear and obedience the state has long used to control its citizens. For years, those who criticized the government paid a high price and were branded as traitors, but today Cubans from a broader cross-section of society are speaking out with less fear. Second, the claim Cuba has a « culture of fear and obedience » is clearly ideologically driven. Londoño doesn’t provide any examples to substantiate this allegation. It is taken for granted this is how Communist governments behave. Violence has never been a tool of population control by the Cuban Revolution. And it is not clear who allegedly paid a « high price. » It would be impossible to name even a single person who paid the ultimate price of his life. Lastly, after failing to establish that the political culture he describes ever actually existed, Londoño argues that culture has now changed – thanks to the U.S. policy shift under the Obama administration. This is a non sequitur. Yes, the U.S. and Cuban governments started the normalization process in December 2014. And subjects that were once taboo are now discussed more openly in 2016. But that does not mean the former has any connection to the latter, much less that there is a causal relationship. Cubans unsurprisingly reject a narrative that puts the United States at the center of the changes in their politico-economic system. Juan Manuel Alvarez, a computer sciences engineer in Havana, disputed the idea that Granma’s publication of the Gourriel brothers departure had anything to do with encouraging Cubans to test the limits of free expression. According to the imperialist narrative, the Cuban government is not capable of representing the political aspirations of its people. So any positive development – real or perceived – is attributed instead to the American government, who do represent the political aspirations of Cubans. But the assumption of American benevolence towards Cuba is belied by the historical record, which shows American officials wanted to create « disenchantment and disaffection » among the « majority of Cubans » who supported the Revolution. The embargo and isolation of Cuba are complementary tactics in an economic war waged on the country for more than half a century. The United States government and media must acknowledge that U.S. policy towards Cuba has never had noble intentions; on the contrary, it was illegal and immoral. And it cannot be retroactively justified by any alleged benefits. Change, to the extent that Cubans want it, should and will be brought about Cubans themselves, without any involvement of the United States. The most benevolent thing the U.S. government can do for Cuba is to cease hostilities against the country. The normalization process is only a partial, first step in that direction. It must also be followed by the complete termination of the embargo; the end of the occupation of Cuban territory and return of the Guantanamo Naval Base to Cuba; termination of financial support for domestic political opposition; and payment of reparations for the hundreds of billions in damages caused by the embargo and decades of terrorism. Cuba affirms its will to advance relations with the United States, on the basis of the observance of the principles and intentions of the Charter of the United Nations and the principles of the Proclamation of Latin America and the Caribbean as a Zone of Peace, signed by the officials of the State and Government of the region, which include the absolute respect for its independence and sovereignty, the inalienable right of all states to choose their political, economic, social and cultural system without interference of any kind; equality and reciprocity. Cuba has shown they are willing to move beyond decades of the U.S. government’s interference, subversion, terrorism and aggression against them. So far, the Obama administration has shown no willingness to oblige. Media narratives that take for granted an American role in Cuba’s evolution encourage the U.S. government to continue its meddling. 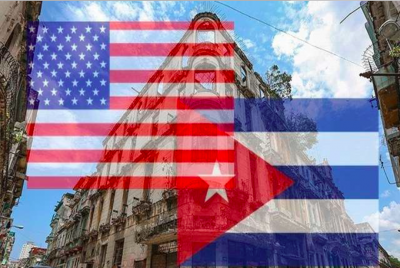 The notion that the U.S. government’s new relationship will bring about positive societal changes in Cuba should be disposed of, along with the imperialist mindset that assumes such an outcome is even possible. U.S. policy should be judged by the extent which the U.S. government stops trying to influence politics in Cuba and lets the island develop independent of any outside pressure.